Saint Ignatius was given the surname, Theophorus, which means “God-clad” or “bearing God.” It’s believed that he was a late convert to Christianity and a disciple of Saint John the Evangelist. Besides what is contained his seven letters, we don’t know a great deal about the Bishop of Antioch (modern day Turkey). Historians tell us that he became bishop in 69 A.D. As a bishop, he stood adamantly against some of the heresies that began to rise within the Church. During the severe persecution of Christians under the Roman Emperor, Trajan, he was condemned to death. After praying for the Church of Antioch and offering up his body, he asked the Roman soldiers to take him to his death, which would bring him into contact with Jesus Christ. He was placed on a ship at the seaport of Seleucia; about sixteen miles from Antioch, but for some reason did not go directly to Rome. The ship traveled along the southern and western shores of Asia Minor. The ship stopped numerous times in cities where Ignatius was able to write letters and speak to the faithful. While anchored in Smyrna, Ignatius wrote four letters: to the Ephesians, to the churches of Magnesia and Tralles and to the Christians living in Rome. While in this city, he also met his friend and fellow disciple, Saint Polycarp. The three bishops that oversaw Tralles, Magnesia, and Ephesus came to see him along with envoys from those cities. After sometime in Smyrna, the Roman soldiers who held Ignatius in custody felt the need to get back to Rome quickly. They did not want to miss the games. Ignatius was a very well known individual and he would draw a large crowd to the amphitheater (the Colosseum was not built yet). However, before reaching Rome, they stopped one more time in the city of Troas. It was in Troas that Ignatius wrote three more letters: to the Philadelphians, to the Smyrnaeans, and to St. Polycarp. As the ship finally made it to Rome, the faithful Christians came out to greet Ignatius with pageantry, but were also sad, for they knew he was to be eaten by the wild beasts. Some of the Roman Christians tried to use their clout (before he arrived in Rome) to have him released, however, St. Ignatius refused. He wanted to see the Lord through his death. He gathered the particular church in Rome to pray for the universal church and that the persecutions facing the Church would end soon. He asked that the faithful to be charitable to their Roman persecutors. As tradition states it, he was quickly brought before the Roman prefect, who had the emperor’s letter condemning Ignatius to death. The day was December 20, 107 A.D.; it was the last day of the games. The soldiers hurried him over to the amphitheater where two fierce lions attacked him viciously and devoured his flesh quickly. All that was left were the larger bones from his body. “Where the bishop is present, there let the congregation gather, just as where Jesus Christ is, there is the Catholic Church.” – Letter to the Smyrnaeans (He was the first person to use the term, Catholic, in reference to the Christian Church [Greek: Katholicos – pertaining to the whole or universal]). 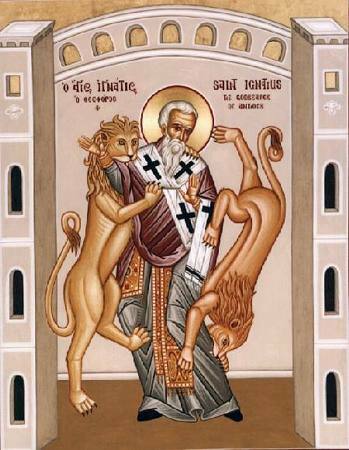 Let us pray: We ask that Saint Ignatius of Antioch intercede for us to Our Lord Jesus Christ when we are persecuted for being Catholics in this world. Give us strength, if the time comes, to be either martyrs for Jesus Christ and His Church. Amen. 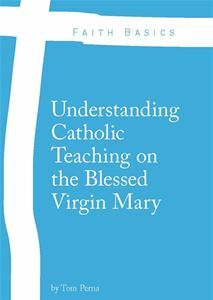 For more information on Eastern Catholicism, please click here. Richardson, Cyril C., Th.D., D.D., Early Christian Fathers. Collier Books, 1995.